After the successful 4 days in Texas, Today King Felipe and Queen Letizia were in Washington – their final stop of 5 days State Visit. 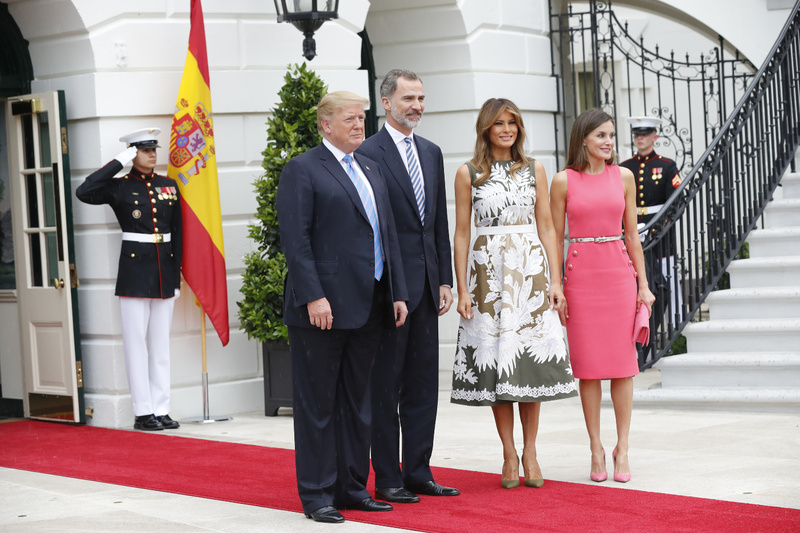 The Spanish Royal Couple visited the White House where they were welcomed by the President of United States Donald Trump and First Lady Melania Trump. The King and Queen held a private meeting at the President Office famously known as Oval Office. Later on both ladies left to enjoy a tea inside the President House and to have discussion on the children charities. The First Lady Melania Trump tweeted about the royal visit on her twitter page. 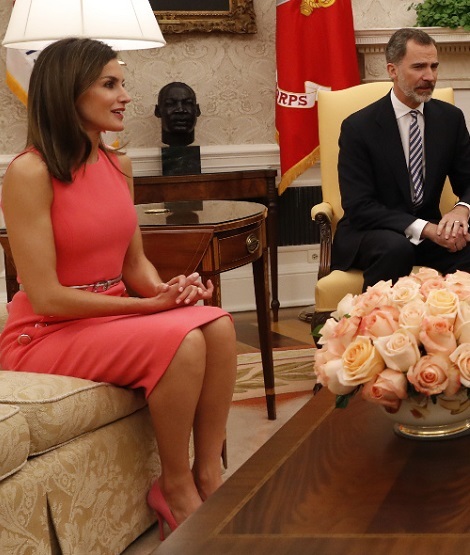 After bidding the farewell to the President and First Lady, King Felipe met with the Leader of the Democratic minority in the House of Representatives Nancy Pelosi. Then the couple headed towards the Andrews Air Base from where they flew back to Spain. 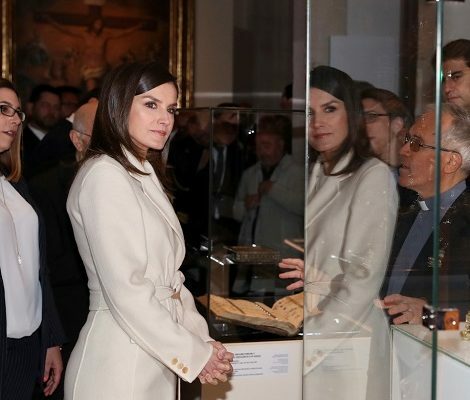 Today Letizia premiered the new piece for her wardrobe. 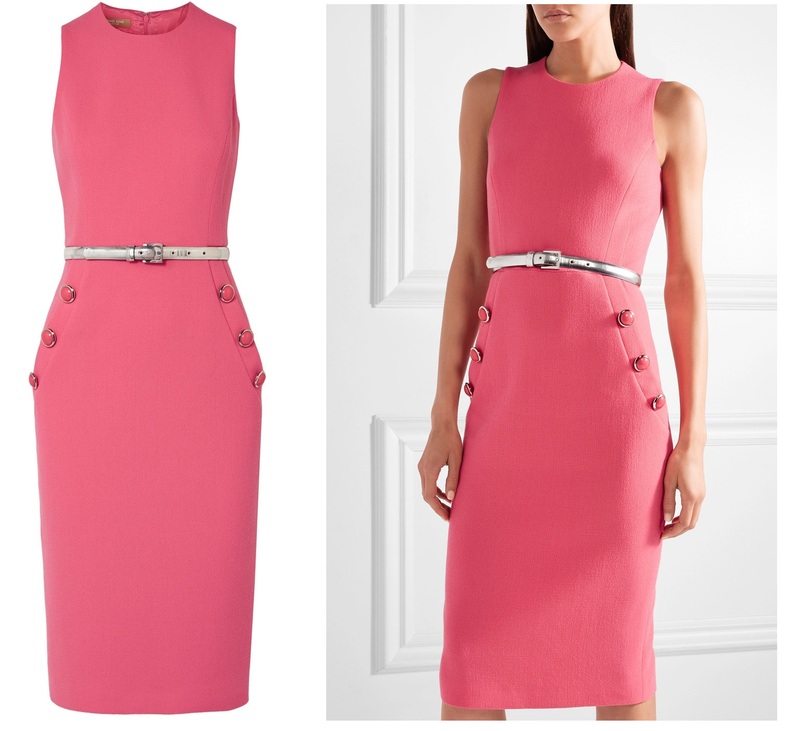 Giving a sartorial node to the host country, Queen wore Pink Embellished wool-blend bouclé midi dress from American Label Michael Kors. This was the first time Letizia wore any piece from Michael Kors. 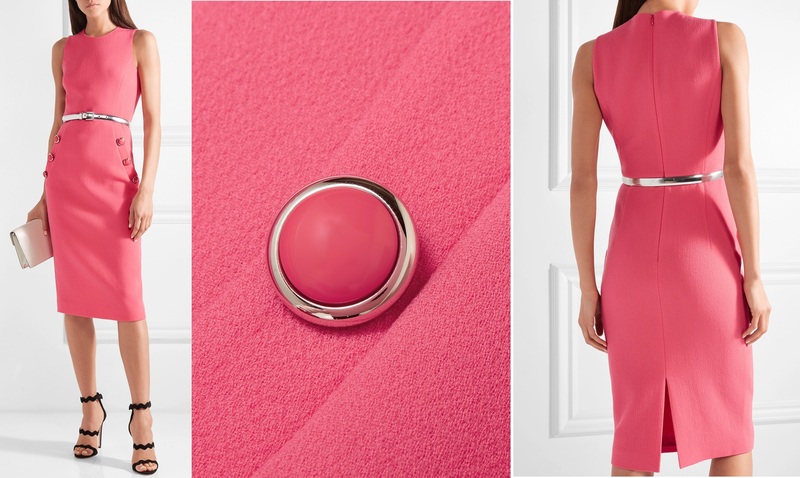 The dress is defined as, “Michael Kors Collection’s midi dress is dyed a vibrant bubblegum hue that feels so right for spring. Cut from wool-blend bouclé, this retro-inspired style is trimmed with enameled buttons along the faux side pockets, and has a sheath silhouette that hugs your curves. 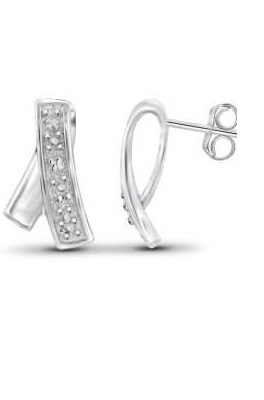 Wear yours with or without the metallic silver belt”. A closer look at the dress. The dress is currently retailing for $1695 at Nordstrom, Neiman Marcus, Net-a-Porter, Bergdorf Goodman. 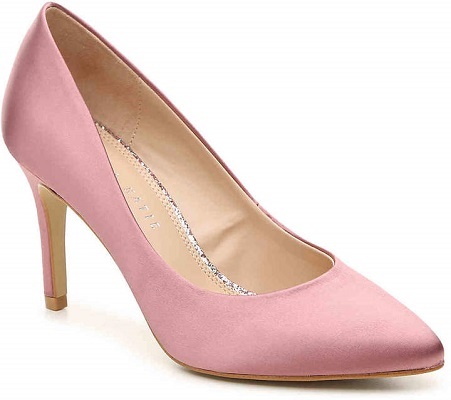 Letizia paired the dress with pink suede pumps by Magrit that she wore in New Orleans. 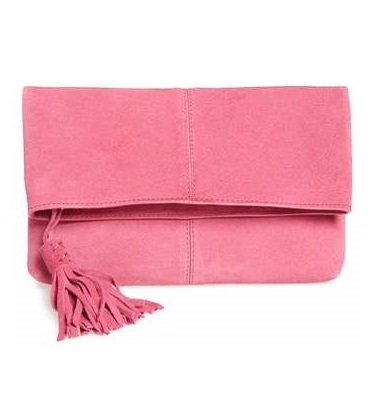 Queen was carrying her pink suede matching clutch from the same Label. 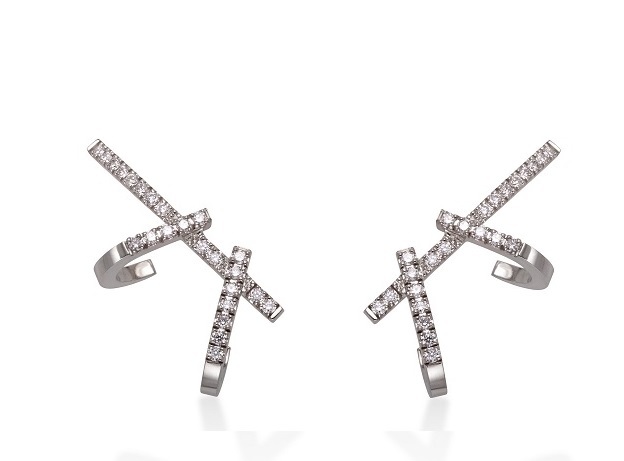 Giving a minimal touch of jewelry Letizia finished her look with Gold & Roses Double Dagger earrings that she premiered in June 2017.